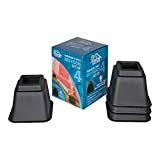 SECURE FIT AND SAFE FOR FLOORS Each of these plastic furniture risers has a recessed cup built in to keep your bed, chair or table firmly in place. The bed raisers easily accommodate bed posts up to 2.75 inches in width or casters measuring 2.75 inches or less. The smooth plastic edges of these heavy-duty bed risers won't scuff floors or snag carpet. IMPROVED MOBILITY For those who have trouble rising from chairs and beds, Home Solutions Bed Risers provide a simple but essential tool for adaptive living. You can use the pieces as bed lifts, sofa risers and chair risers to find the best height for you or your loved one. RAISE YOUR WORK TABLE Get rid of the backache that comes from leaning over a table that's too low. Home Solutions 5-Inch Bed Risers make great table risers. Elevate your table 5 inches and enjoy a work surface that's just right for you. 100% MONEY-BACK GUARANTEE OF SATISFACTION Home Solutions furniture risers are among the best on the market. Should you find a flaw in the workmanship or function of your furniture elevators, Home Solutions will provide a full refund or replacement. Order with confidence today.